A superb collection of short stories of contemporary rural and urban South American and Western landscapes – essentially a memoir of Lucia Berlin who died too early. Raw, bleak, funny, off beat, and compassionate. Compelling American short fiction. 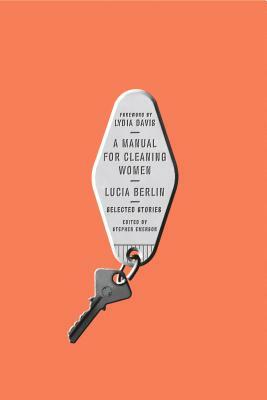 A MANUAL FOR CLEANING WOMEN compiles the best work of the legendary short-story writer Lucia Berlin. With the grit of Raymond Carver, the humor of Grace Paley, and a blend of wit and melancholy all her own, Berlin crafts miracles from the everyday, uncovering moments of grace in the Laundromats and halfway houses of the American Southwest, in the homes of the Bay Area upper class, among switchboard operators and struggling mothers, hitchhikers and bad Christians. Readers will revel in this remarkable collection from a master of the form and wonder how they'd ever overlooked her in the first place. Lucia Berlin (1936-2004) worked brilliantly but sporadically throughout the 1960s, 1970s, and 1980s. Her stories are inspired by her early childhood in various Western mining towns; her glamorous teenage years in Santiago, Chile; three failed marriages; a lifelong problem with alcoholism; her years spent in Berkeley, New Mexico, and Mexico City; and the various jobs she later held to support her writing and her four sons. Sober and writing steadily by the 1990s, she took a visiting writer's post at the University of Colorado Boulder in 1994 and was soon promoted to associate professor. In 2001, in failing health, she moved to Southern California to be near her sons. She died in 2004 in Marina del Rey. Her posthumous collection, A Manual for Cleaning Women, was named one of the New York Times Book Review’s Ten Best Books of 2015. Lydia Davis is the author of one novel and seven story collections. Her collection Varieties of Disturbance: Stories was a finalist for the 2007 National Book Award. She is the recipient of a MacArthur fellowship, the American Academy of Arts and Letters’ Award of Merit Medal, and was named a Chevalier of the Order of the Arts and Letters by the French government for her fiction and her translations of modern writers, including Maurice Blanchot, Michel Leiris, and Marcel Proust. Lydia Davis is the winner of the 2013 Man Booker International Prize.